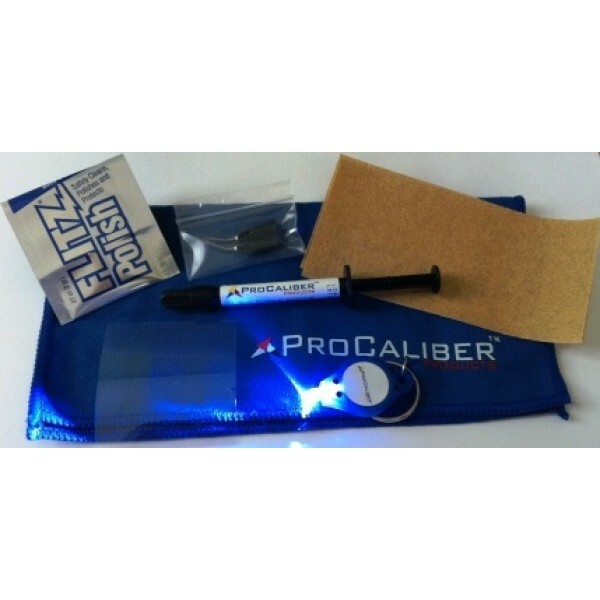 ProCaliber Products™ Clear Granite and Marble Repair Kit Permanently repairs chips, cracks and gouges in granite and marble. Clear material allows natural stone pattern to remain visible and becomes more transparent over time. Extremely fast, Light Curing Acrylic material hardens in seconds using only light and never needs to be re-touched again. Safe for use in food preparation areas unlike epoxies and resins. UV and waterproof - will not fade or yellow or spring a leak over time. Contains enough material for several small repairs. If your repair is larger than 1/2" in diameter or deeper than 1/2", we suggest purchasing our Clear PRO Paste Repair Kit.